Just after lunch, Kyle, who works in the engine room, escorted Dave, Donovan, and me through one of the most important parts of the ship- the power station! Wearing our ear protectors, we saw and heard the engines, the drive shafts, the electric power plant, and all the control panels. There are what appeared to be miles of pipes and wires sending the energy to all parts of the ship. The ship is truly a city on the water. 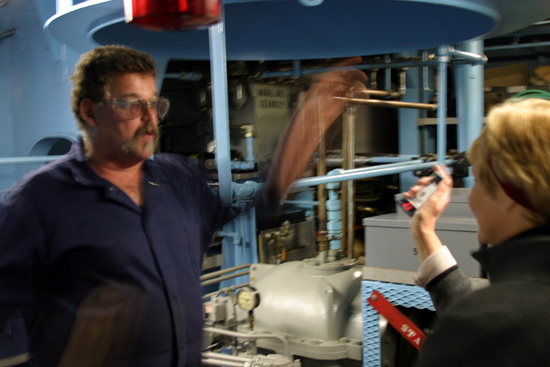 On the same level in the bottom of the ship, we also visited the waste water treatment facility. Here the sewage produced on the ship is cleaned and disinfected before it is sent in to the ocean. Traveling through a narrow passage way, we reached the salt water distillation equipment. Salt water is pumped from the ocean into the ship. 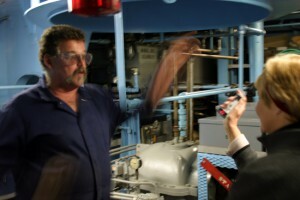 Then, it passes through reverse osmosis equipment to produce the water for drinking, bathing, and cooking on the ship. I tasted some water from a water fountain near the distillery. It was delicious! After we saw all the machinery, Kyle showed us the storage area for all the tools and spare parts for all the machines. It looked like a Home Depot at sea! The tools included pipe wrenches over three feet long! Kyle's work station is in the tool storage area. He specializes in welding metal parts that need to be made or repaired. Another crew member, a woman named Sasha, works near Kyle. She is the plumber. The control panels for all this equipment are in an air conditioned room. It is very hot especially near the diesel powered engines that generate the electricity for the ship. The computers, dials and switches reminded me of pictures I have seen of controls in a space ship!